BISHOP, Calif. -- A 21-year-old woman died from a rare but incredibly lethal parasitic killer, according to the Centers for Disease Control and Prevention. Naegleria fowleri is the name of the amoeba which attacked the woman's brain tissue, eventually sending her into cardiac arrest. Humans are infected when the amoeba enters their bodies through their noses while swimming or diving in warm freshwater. It then migrates its way through the skull to the brain, where it eats away at the brain tissue. You can't catch it from simply drinking contaminated water, the CDC says. The risk of infection is extremely low. There are less than 10 cases are reported each year, and it has never been shown to spread from person to person. However, the probability of death is virtually 100% if contracted. The victim first felt symptoms on June 16th and was initially diagnosed with meningitis at Northern Inyo Hospital. Her condition continued to worsen however, and she was flown to Renown Regional Medical Center, where she later died of primary amoebic meningoencephalitis, the Reno Gazette-Journal reports. 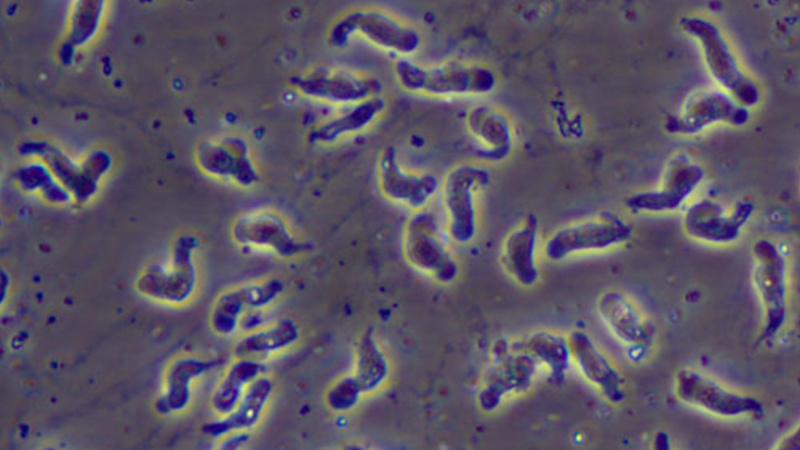 Public health officials do not believe the amoeba represents any risk to the general public. There have been no evident cases of amoeba contamination in the U.S. in well-maintained, properly treated swimming pools or hot springs, according to California public health officer Richard Johnson. It is believed the woman contracted the amoeba on private property. You can learn more about Naegleria fowleri by tapping here.